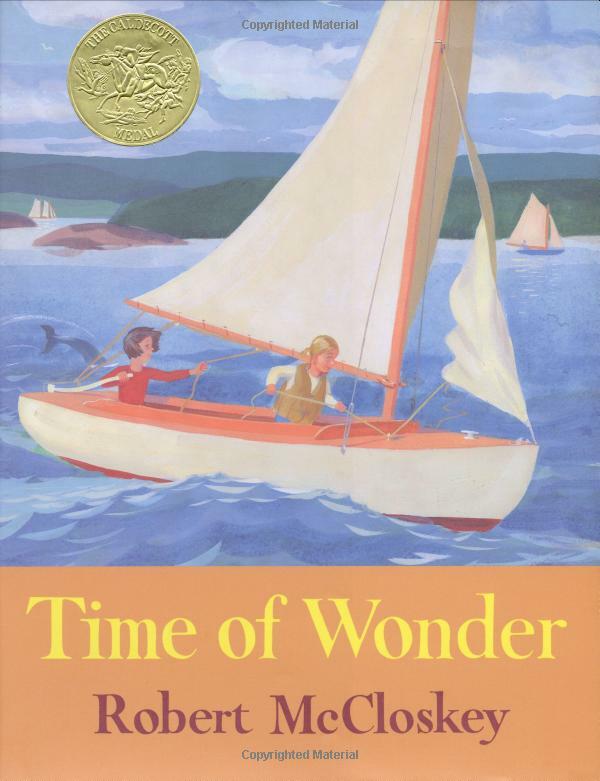 Robert McCloskey’s Time of Wonder ranks in my mind as one of the best children’s picture books ever. Granted that my “one of the best” is somewhat limitless, I cannot make it through this book without marveling at the artist/author’s marriage of truly extraordinary art with lyrical and evocative language. Those who have been fortunate to live or vacation somewhere on the New England coast in summer will find that the author manages to put to words the feelings associated with many elements that make summer unique and magical. Whether it is a sudden shower over the water, “porpoises puffing and playing around your boat” or the wonder of “where hummingbirds go in a hurricane”, McCloskey captures the very essence of this time of year. Having never visited the Eastern shore in summer before actually reading this book to my children, I subsequently visited there one June as an adult. Riding bicycles through the quaint town of Duxbury, Massachusetts, my husband and I arrived at a very long teak bridge that took us to an outlying sand spit. Stopping on the bridge to take in the marvelous scene of sand, sea and shore, we noticed a small black cloud moving our direction. Suddenly we were in the opening scene of this marvelous book! For those who cannot manage a trip to the Eastern shore in summer, let McCloskey take you there in a Time of Wonder. We recently read this book due to Elise Hooper’s suggestion (Children’s Book Monday @ A Path Made Straight). We really enjoyed it, and you are so very right, it feels like you are right there, in the midst of the storm! I was not raised reading, so I didn’t grow up with McCloskey. We first found Blueberries for Sal a few summers back through Veritas Press. My then 1st grade daughter read it for Summer Reading, and we have loved it ever since. She smiled and shared it with her younger brother this past school year.